The WP CAMP BEACH water polo campus in Málaga will incorporate numerous recreational and sports activities that will complement the technical water polo sessions that will be held in the spectacular facilities of Inacua Málaga. With the objective that the participants enjoy an unforgettable week, the Malaga camp will have several sport sessions on the beach and excursions to a fantastic water park, activities in the sea and the river. An intense week of water polo and fun in which English will be the language we will use in all these sessions outside the pool. Half a week, the whole group will spend a day of maximum adrenaline at the Aqualand Torremolinos. The boys and girls attending the WP CAMP BEACH will have a great time at the more than 20 water attractions in this park. It will be a day in which both players and coaches will enjoy the good weather of the Andalusian summer in this facility, a reference on the Costa del Sol. Another one of the marked days of the week will be the one that we will dedicate to doing activities in the malagueña beach with the company MalagaWake. 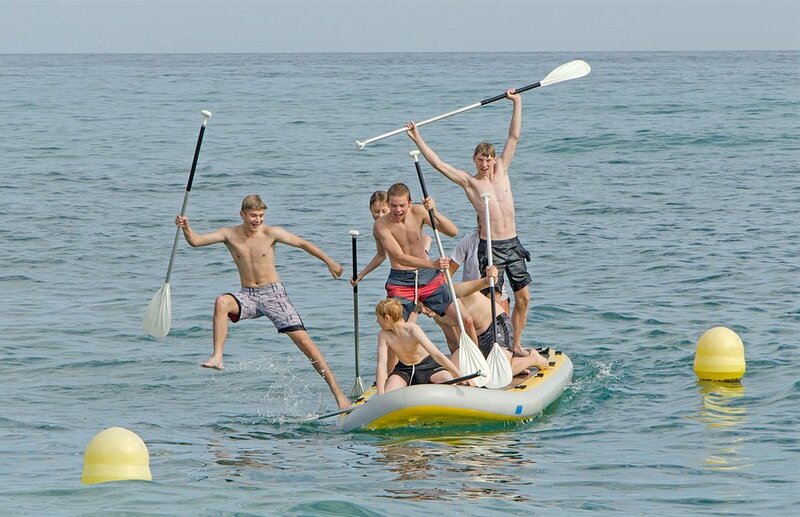 The participants will go up to La Banana, an inflatable mattress pulled by a motorboat and that can carry up to 7 people. We will also climb the Big Sup, a modality of Paddle Surf in which to have a good time of racing and games. The trekking along the Guadalmina River enjoying the Malaga nature will be the other great week out of the WP CAMP BEACH campus. All these activities will complete the numerous sports sessions both on the beach and in Inacua Málaga, where we will work on aspects related to nutrition, injury prevention and stretching in an enjoyable way and in English. In short, seven intense days of water polo and emotions to the fullest. New male U16 water polo tournament!